Blogging is a creative outlet. It's fun, personal, purposeful, provides connection and a sense of accomplishment. But blogging can also be a struggle, especially when you feel like you're typing at a blank wall. While there are tons of ways to increase your blogging community, we can't forget about plain ol' social sharing. You may not feel comfortable with putting yourself out there, but let me break it to you: if you're blogging, you're already putting yourself out there. Give yourself a hand and do a little promotion. 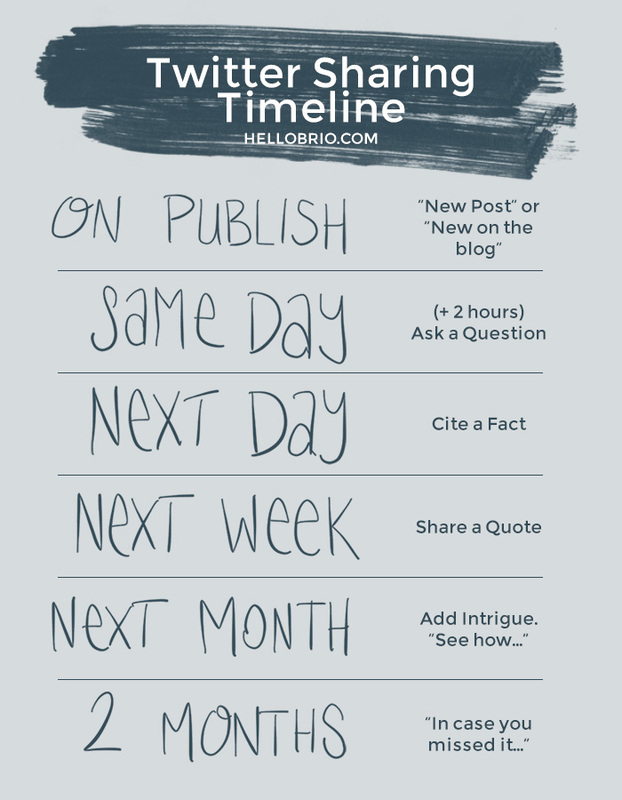 Several months ago, I was fortunate enough to come across an amazing post about a social sharing schedule. You'll notice that this approach involves tweeting out the same blog post several times, but most importantly it talks about different messaging for each tweet. Work out the formula that will go best with your content. Whether you change the content or the schedule of your timeline is up to you. The 2 important things? Keep it to a schedule that you can accomplish for all of your posts and that you feel comfortable with. This is a great exercise in content marketing and copywriting. With your timeline in hand, you've taken the guesswork out of how many times you should promote your post and what the content should be. You can schedule your posts all at once with Tweetdeck, taking care to change times of day and the @mentions and hashtags you use. Tweets with beautiful and relevant images get higher visibility. In an oversaturated world, we're drawn more to pictures and other visuals that will help us summarize content or create intrigue to click through. Recently Chrystina told me that TweetDeck now allows you to schedule tweets with images. Game. Changer. Bitly.com offers link shortening customization for free. Therefore, a scraggly and scary bit.ly link can now look very pretty. For example, my recent hand lettering tutorial can be shared with the pretty link bit.ly/brushcalligraphy instead of something that looks like this bit.ly/1opfqx9. Creating an account with Bitly will also allow you to see the number of clickthroughs on a particular shortened link, whether you share it on Twitter or elsewhere. Also, per the example above, mention the brand or person in one or two of your block of tweets, where it's appropriate. Last but not least, Twitter is only as good as what you put into it. Same goes for everything else, especially in the social media world. If you find yourself hating a social media platform, you may not be using it correctly. That's not to say that you need to use every platform available (heck, I deleted my Facebook page several months ago and don't regret it at all), but you need to commit to the ones you're going to use. So on Twitter, make sure to set aside time to share relevant content that isn't yours. Take 15 focused minutes every day to schedule a few tweets for articles that are relevant to what you blog about. Make sure to tag the author (you'll make new friends who will share your work!) and to include your two cents on the topic you're sharing. Don't just tweet out the title and the link. So now you can tweet like a pro, with a time investment of maybe 15-20 minutes per day. When you have a new post, schedule all of your posts with your timeline using Tweetdeck. Use hashtags and try different days and times of days. Mention brands or people where appropriate, and always use an image. Then spend a few minutes each day or every other day scheduling posts by other bloggers that are relevant to your content.